Nascar including drivers like Jeff Gordon, Dale Jarrett, Mark Martin, Rusty Wallace and Dale Earnhardt, this is the game for you. 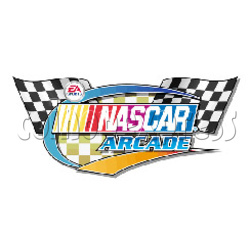 EA Sports Nascar is the first officially licensed Nascar racing game for coin-op. Player controls include a real racing steering wheel, a four-speed manual or automatic transmission, a view change button, and a brake and gas pedal. The roar of racing is delivered through four speakers with two mounted in the dash and two in the headrest. Electronic feedback steering gives players a little taste of what it's like to wrestle with an 800 horsepower engine. Along with the drivers, Sega utilized the real Nascar paint schemes on the Nascar circuit. Even 7-time Nascar champion Richard Petty makes an appearance in the game, (but you have to know where to find his car in order to drive it). The game allows you to test your skills on three of Nascar's most popular tracks, a super speedway, a twisting road course and a short-track oval.